John Perkins Center for Reconciliation, Leadership Training, and Community Development became a first of-its-kind partnership among the John Perkins Foundation of Jackson, Mississippi, Seattle Pacific University, and Christian community leaders throughout the Pacific Northwest. Guest speaker David Kasali (center) at the “For Such a Time as This” conference. Speaking to the Seattle Pacific University community and church leaders gathered at Seattle's First Free Methodist Church, David Kasali, president of the Congo Initiative, offered a personal observation: Lamentation, he said, can be a gift that leads to vision, action, and hope. 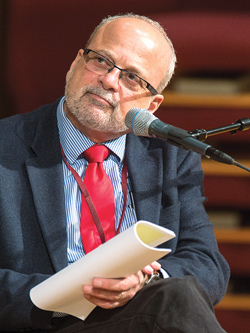 “For Such a Time as This” — a conference exploring the challenges of hope and reconciliation in the contexts of global crises and conflicts — took place at SPU from April 23—25, 2015. 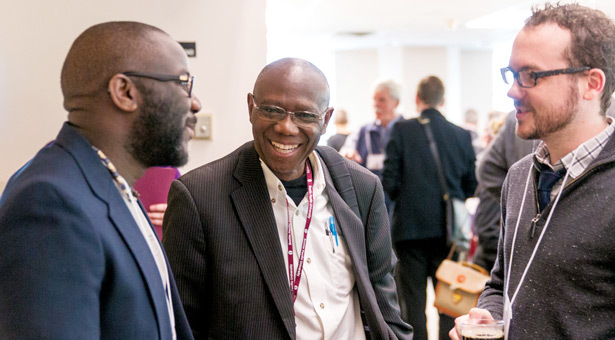 Organized by SPU’s John Perkins Center for Reconciliation, Leadership Training, and Community Development, the conference hosted speakers from ScholarLeaders International, an organization that supports Christian leaders in the majority world as they pursue post-graduate education. Kasali spoke of how, while working in his prestigious position as the president of Africa International University, he learned of the deaths of his brother, sister, and pregnant niece — casualties in the Congo war that cost more than 5.4 million lives since 1998, according to an International Rescue Committee report. Then he described how his experience of lamentation led him to work in the U.S. for three years, building partnerships with churches and other organizations to establish the Congo Initiative: holistic ministries provided by various church denominations to rebuild lives, families, and communities in the Democratic Republic of Congo. Kasali believed that God was calling him and his wife home to Congo, even though it seemed like a suicide mission. But they were faithful, and they have since founded Christian Bilingual University of Congo to educate the next generation of Congolese Christian leaders. He now serves as its president. 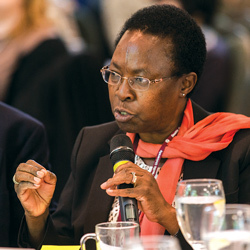 The conference also welcomed ScholarLeader Gladys Mwiti, founder and CEO of Oasis Africa, the first Christian counseling center in Kenya, who is a psychologist working with trauma survivors and training counselors in programs throughout the Great Lakes region of Africa. The other ScholarLeader was Salim Munayer, founder and executive director of Musalaha Reconciliation Ministries, who teaches a theology of reconciliation for Israelis and Palestinians.